As dietician Sheela sherawat explains, Beauty really originates from the inside. There may be certain signs of beauty that are more apparent like glossy hair, strong nails and glowing skin. Our food that we eat contains a lot of beauty ingredients that have been used by people time and again. However, there is no magic that can keep you looking young forever (not until now), but having a healthy diet and lifestyle largely affects how you look and how you age. These are some of the tips from our diet clinic to strong, healthy skin, hair and nails. • Proteins- the most important ingredient: Our skin, hair and nails- all are mostly made out of proteins called keratin, collagen and elastin that help in reducing your wrinkles and provide strength and elasticity. Most of our supply of protein comes from meat, chicken, fish, legumes, eggs and dairy foods. • Seafood for essential fats: Our body needs fats in order to function properly. Not all those saturated fats, but omega-3 and omega-6 types. These fats produce hormone like substances called prostaglandins which further decompose into other essential substances that boost immunity and inflammation in the body. • Iron for vitality and lustre: Always feeling tired and low on energy can be sign of iron deficiency. 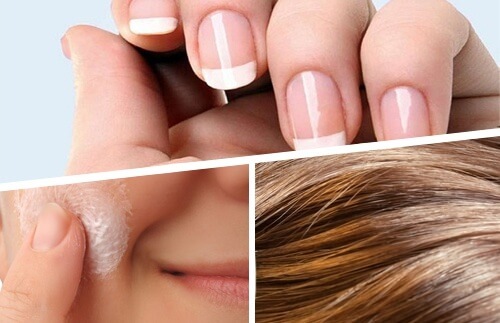 Due to this, your hairs, nails and skin suffer a lot. Your skin may turn pale and itchy, or there may be cracks at the side of the mouth. Nails may become brittle and show vertical stripes or even become spoon-shaped. You could lose more hairs and they will become more dry, brittle and dull. • Kiwifruit and Citrus for Vitamin C: vitamin C is an important ingredient for the formation of collagen which is the structural element of the body. It forms the plumps under the skin and gives it support and shape. Skin tends to lose this collagen as you age.